Would you like to impress friends at your Fourth of July event? Ask: “Who was America’s first “foodie” president?” Answer: “Thomas Jefferson”. The third President of the United States and principal author of the Declaration of Independence was also what would be considered today… a foodie. And, of course, whenever I think of a foodie, I think… olive oil. And so did Jefferson, who proclaimed, “… the olive tree is surely the richest gift of heaven". As a former history teacher, learning about America’s founding fathers has always been of interest to me. The scholarly Jefferson not only spoke five languages and founded the University of Virginia, but was also a plantation owner, botanist and gardener. He introduced many new plants in the new world and desperately planted olives only to be heartbroken over his inability to produce a harvestable crop of olives and to establish an olive culture in South Carolina. After the agricultural society of South Carolina commissioned him to purchase young olive trees, Jefferson spent years promoting their cultivation, but by 1804 he had to admit failure. He blamed it on the “nonchalance” of the South Carolinians, who were not enthusiastic about a plant that took years to produce its first crop and was not appealing to impatient American farmers (Americans were impatient even then!). The farmers retorted that it was the climate that caused their failure, with its random frosts and humidity. Deemed a “necessity of life” along with wine and books, Jefferson made sure that he had his own supply of the precious liquid gold and imported four to five gallons of olive oil a year from France. A recent archaeological excavation at his Monticello home revealed fragments of a French olive oil bottle in the basement. Jefferson’s principal diet was vegetables, especially salads. In fact, salad oil appeared to be a “perennial obsession” for Jefferson. According to The Virginia Housewife, considered by food historians a “most influential” cookbook of the 19th century, Mary Randolph (first cousin of Jefferson) described Monticello salads in detail. Salad greens from his garden included various types of lettuce, spinach, endive, mache, peppergrass, French sorrel, cress and sprouts. Randolph noted that the greens were gathered in the early morning and were placed in cold water or ice until dinnertime and then drained. The salad dressing was prepared with olive oil, vinegar, hard-boiled egg yolks, mustard, sugar and salt and then garnished with sliced egg whites and scallions. 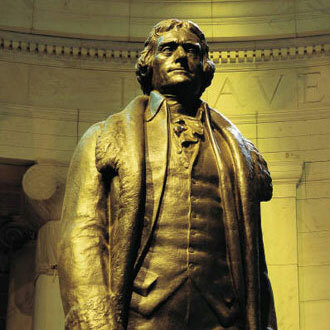 Perhaps his love of olive oil and its regular use in his diet are the reasons Jefferson lived to 83 at a time when the average lifespan was 40.